Glass is among the most versatile of materials. Depending on its composition, treatment, and manufacture, it can be customized for high performance in countless applications. In order to get the right fit for your next glass project, remember to consult properties such as the corrosion resistance, thermal properties, viscosity, dielectric properties and refractive index of potential materials. These properties tell a lot about how a material reacts to its environment, which is especially important for your application’s performance. When compared to other types of glass, borosilicate has a high corrosion resistance to acid, but a low corrosion resistance to weathering. Its thermal expansion is very low, and its volume resistivity and thermal shock resistance are both high — but not the highest. Its light transmission is excellent. Pyrex® and Borofloat® are common types of borosilicate, though both Schott and Corning craft a series of variations with increasingly specific properties. Because of its resistance to high temperatures and chemical corrosion, borosilicate makes an excellent material for the biomedical and research industries. It’s also an ideal material for optical, lighting and industrial applications. Because this is a glass that demonstrates strength without being the absolute strongest, borosilicate is an affordable material, making it extremely popular in many industries. Of all possible glass materials, it’s the Swift Glass choice for all of our annular edge glass. Its edges can be ground specially to be sealed in a flange for biomedical, research, optical, optoelectronic, photonics and analytical applications. The additional safety and dependability offered by tempered glass serves many industries, from automotive to medicine. For quick reference, the Swift Team has assembled a Glass Material Properties Chart addressing some of our most popular material choices, ranging all the way from soda lime glass to fused silica. We also offer material consulting from our team of experts, as well as tempering services for specialty projects. 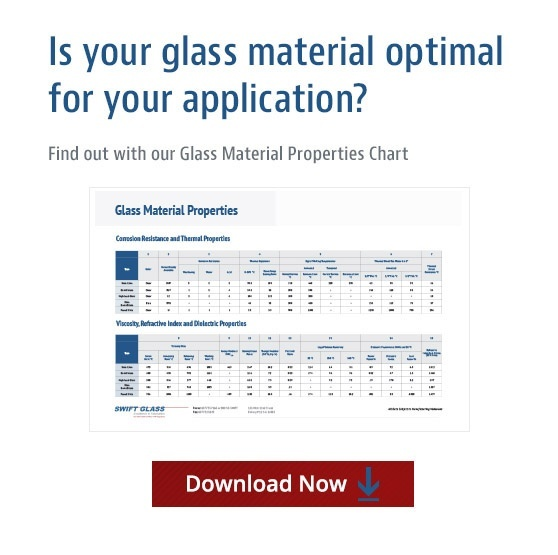 Download the Glass Material Properties Chart now, or contact the team to learn more today. Computers, optical and other technological manufacturing industries require glass wafers as a carrier substrate for safe fabricating of delicate products like thin silicon wafers. Glass wafers are also essential to the semiconductor, electronics, and biotech industries in a variety of applications. Glass wafers begin with the highest quality glass. We typically work with Borofloat, Borosilicate, Quartz, and Eagle XG, selecting the most consistent glass sheet from the best batches. Wafers are cut from these sheets to be further processed. The carefully selected and cut material is then ground to build out the wafer’s general shape. The edge profile of the wafer is machined to specifications with the use of diamond tools. For example, a wafer could be crafted with a flat or notch, depending upon the design, and with an edge profile that is either flat-ground or pencil-ground. The notch, if designed, serves as a precise locator. The product is lapped, and the profile accuracy gets checked. Both sides of the wafer are polished. Glass wafer inspection must be highly controlled in order to guaranteeprecision — the product is taken to a clean room with climate control, and the profile is recorded by laser. The laser passes over the glass three times while another gauge reads the wafer’s total thickness variation (TTV). The larger the wafer, the more critical the TTV. After more than eighty years of glass manufacturing, the Swift Glass Team has developed highly specialized design and production capabilities. We are proud to take on the complex challenges that come with specialty products like glass wafers. For more information about our processes, check out our library full of free resources.